The NMSB XII family of crash beam barriers is ideal for access-control scenarios with low to medium vehicle-traffic. Drop arm barrier operation overcomes terrain issues due to snowplows or other roadway obstacles. 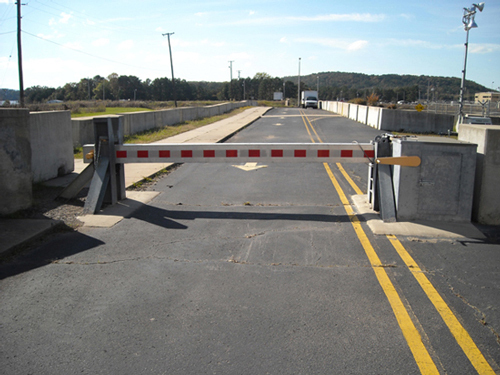 Their optimal operation, as “sally-port” systems to work in unison with Nasatka’s steel-plate or bollard barriers, creates a virtually impenetrable stoppage and trapping configuration. The standard barrier opening lengths range from 10′ to 30′ in the down and secure position. The middle of the barrier is nominal 32 in. (81.28 cm) above the ground. Hot-dip galvanized for years of service, Nasatka’s drop arm barriers feature a self-contained, attached housing unit. Standard barrier deployment time is 8 – 15 seconds per cycle depending on varying barrier size and operator type. Vertical, horizontal, sliding open/close options, as well as custom sizes and configurations, are available.